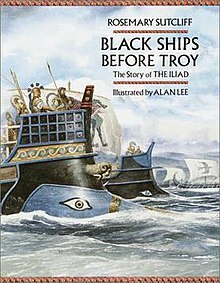 Black Ships Before Troy: The story of the Iliad is a novel for children written by Rosemary Sutcliff, illustrated by Alan Lee, and published (posthumously) by Frances Lincoln in 1993. Partly based on the Iliad, the book retells the story of the Trojan War, from the birth of Paris to the building of the Trojan Horse. For his part Lee won the annual Kate Greenaway Medal from the Library Association, recognizing the year's best children's book illustration by a British subject. Kirkus Reviews noted the "compelling vision and sensitivity to language, history, and heroics" that she brought to retelling both Arthurian legends and the Homeric epic. The Reading Teacher remarked that the book's division into 19 chapters makes it a good text to spread out over multiple readings, and praised Sutcliff's "graceful, powerful language". Sutcliff's prose is praised also in Books to Build On, a collection of teaching resources edited by E. D. Hirsch, Jr.. A Common Core handbook suggests it for grades 6-8. Delacorte Press reprinted Black Ships in the US within the calendar year (October 1993; ISBN 978-0-385-31069-7). Sutcliff's retelling of Homer's Odyssey story was also illustrated by Alan Lee and published by Frances Lincoln in a companion edition, The Wanderings of Odysseus: The story of the Odyssey (1995, ISBN 978-0-7112-0862-9). Kirkus praised both Sutcliff's text, for preserving "a certain formality of language" and for graceful "winnowing", and Lee's "spectacular paintings": "Beautiful and detailed ... the pictures are obviously the result of careful research and reward close scrutiny. A gorgeous book, more than worthy of its predecessor." It suggested the book for ages 10 and up. ^ "Black ships before Troy" (first edition). WorldCat. Retrieved 2012-07-15. ^ a b "Black ships before Troy: the story of the Iliad"[permanent dead link] (first US edition). Library of Congress Catalog Record. Retrieved 2012-10-13. ^ (Greenaway Winner 1993). Living Archive: Celebrating the Carnegie and Greenaway Winners. CILIP. Retrieved 2012-07-08. ^ a b "Black Ships Before Troy". Kirkus Reviews. 15 October 1993. Retrieved 2012-10-13. ^ Freeman, Evelyn B.; Barbara A. Lehman; Patricia L. Scharer; Christine G. McLeod (1997). "Children's Books: Literary Collections". The Reading Teacher. 50 (5): 420–28. JSTOR 20201792. ^ E. D. Hirsch, Jr.; John Holdren, eds. (2009). Books to Build On: A Grade-By-Grade Resource Guide for Parents and Teachers. Random House. p. 90. ISBN 9780307567215. ^ Manville, Michelle (2014). Common Core State Standards for Grade 6: Language Arts Instructional Strategies and Activities. Rowman & Littlefield. p. 45. ISBN 9781475810165. ^ "Formats and editions of The wanderings of Odysseus". WorldCat. Retrieved 2012-10-13. ^ "The Wanderings of Odysseus". Kirkus Reviews. 15 May 1996. Retrieved 2012-10-13. ^ Helbig, Alethea; Perkins, Agnes (1997). Myths and Hero Tales: A Cross-cultural Guide to Literature for Children and Young Adults. Greenwood. p. 146. ISBN 9780313299353. This page was last edited on 14 April 2019, at 15:32 (UTC).